Chemical Cold Packs / Instant Ice Packs / Instant Cold Compresses temporarily relieve minor pain and swelling for sprains, aches and sore joints. 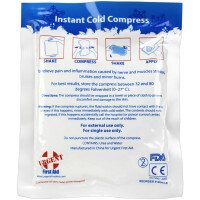 Our Instant Chemical Cold Packs are conveniently disposable with no pre-chilling required for quick, effective relief. Be sure to note the substantial savings when purchasing in bulk quantities - from just 28¢ per pack!. New Urea Cool Packs can be expressed shipped with no Hazmat fees, too - call Toll Free for questions or information. 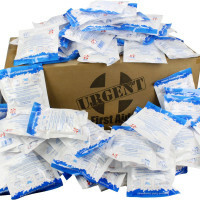 We Manufacture our own Instant Cold packs, so the savings go straight to you - see our instant ice packs at wholesale, when you buy bulk! Check out the COOL Kids Ice packs. Also see: Ice Wrap Reusable Hot & Cold Packs Heat Packs & Warmers NEW! Hot or Cold Pack? Learn When and How to use Cold for Injuries! Where else can you buy individual and boxed cold compresses & wholesale bulk instant cold packs from 28¢? R-I-C-E which stands for REST, ICE, COMPRESSION, and ELEVATION. REST: This should be obvious to anyone suffering a severe strain or sprain, but should be observed even by those simply suspecting injury. Rest simply means, "Don't walk on a sprain." Repeated use of the injured area may mask the pain, cause further injury, or increase the time needed to heal. ICE: This is perhaps the most important aspect in dealing with an injury of this type. Applying ice to the injured area is necessary to control internal bleeding, reduce pain and swelling, and to facilitate the body's natural healing processes. Many people prefer the use of heat for sprain and strain injuries. Understanding the physiological changes that take place with each may prevent this mistake from being made. A sprain or strain often involves the tearing of connective tissues, muscles, and often blood vessels as well. The application of heat will relax the muscles and dilate the walls of the blood vessels in the area. While a warm spa may sound more inviting than a bucket of ice water, the heat will increase bleeding and swelling in the damaged area, slowing the healing process. Conversely, ice constricts the blood vessels, slowing the bleeding and reducing painful swelling of the tissues. CAUTION: DO NOT APPLY ICE DIRECTLY TO SKIN. IT MAY CAUSE FROSTBITE. ALWAYS PLACE A FABRIC BARRIER BETWEEN THE ICE OR COLD PACK AND THE SKIN. COMPRESSION: A pressure bandage may be applied to restrict blood flow and swelling of the area. Be cautious not to apply a pressure bandage too tightly. Check distal pulse, movement, sensation, and capillary refill before and after applying a pressure bandage to ensure that the extremities are receiving sufficient circulation. ELEVATION: Elevation of an injured body part above the level of the heart is another method of controlling blood flow and reducing swelling of the injured area. Do not elevate any area if you suspect it may cause further injury.